With Canbet you are actually offering up to £200 in bonuses. They have two offers, one is for £30, in order to get this use FREEBET is your promotional code when prompted at the point of signing up. You need to deposit £20 in to your CanBet account to get this. TO get the full £200 bonus you need to make a deposit of £6000 with the use of the following promotional code, HIGHROLLER when prompted during registation. All bonuses are the obtainable thought the CanBet control panel. Canbet offers over ten years experience for its members but not a lot else is disclosed on the website. Straight from the off, the Canbet site appears slightly less professional in comparison to sites created by rival firms and it does not make quite as good first impression. The Canbet website appears to be more cluttered than many of its peers and rivals. There is a whole space on the right hand side of the screen that is not being used and the rest of the information seems squashed into a small space. That aside, the layout follows the same design as the majority of websites with market and sportsbook options down the left hand side and more general selections running across the top of the window. The live help facility is easy to use, there is nothing too difficult to understand. The sportsbook covered the main sports but there wasn’t a great deal of variety beyond that. That may not be a problem if you just want the occasional flutter on a sport you follow but for someone who regularly bets there are currenty a bit of a lack of options. There was a good selection of lesser leagues when it came to football betting but the match options were not quite as comprehensive to other rival sites. Horse and greyhound racing was very well covered and regular pundits of these sports should be more than satisfied with the selection. There is a smaller variety of gaming options than many rival sites though. Clicking on the Games icon, it was a surprise to see the option of only 1 game to play. Whilst the options in the Casino and Poker elements were fuller, there wasn’t the variety that some sites are available to offer. There was also not yet a Lotto or Bingo element which is becoming increasingly popular. To play the games you will need Flash Player installed or download the actual game from the site. The site itself does not initially explain the details of the opening offers before they give you a form to fill in with your details. A banner informs you that you can receive up to £200 for joining but clicking on it and just takes you immediately to a registration screen, although it is a great offer, we feel the incentive to take the process further simply isn't there. Additional searching on the site indicates there are a range of percentage based bonuses depending on how much money you deposit. When depositing these amounts you also have to insert a password. To receive the free £200 bet, a person has to deposit around £680 to the site. 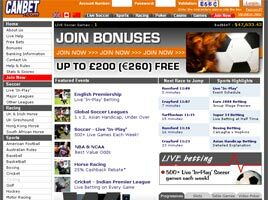 There are also opening offers attached to the Poker and Casino sections of the website. We feel these could be better promoted and slightly easier to use, then clearly they would have maybe the best offers from any bookmaker. The features of interest from Canbet focus on the money back offers they have on certain bets and the assurance that they offer a lower price than other bookmakers. That aside, the site is still developing and is currently not yet at the level as say the bigger well-known bookmakers, but we feel certainly worth a try.